After a successful premiere last year the second edition of the EHF Club Management Seminar takes place on the fringes of the 2013 VELUX EHF FINAL4 in Cologne, Germany. Three main topics – branbuilding and -management, social media in sports and best practice of clubs were under spotlight of the three-day workshop organised by the EHF Competence Academy & Network (CAN). “Last year we found out that clubs want to be in touch with the EHF and want to take part in platforms and communities so they can share experience and points of view in a relaxed and professional atmosphere,“ the EHF coordinator Helmut Höritsch said. “Therefore we tried to involve real experts – external experts from universities and excellent people from various institutions,“ Höritsch added. One of the aims of the seminar is to find networks outside the sport – with economies, or with municipalities. Many clubs also feel a need to find more ways how to increase a contact to young people not primarily interested in handball from the beginning. How to easily get in touch with them, how to bring them closer to sport with benefit for all people involved. “The central message of the seminar is to exchange the best practice examples from every day work in clubs, but also sharing experience from other sports like ice hockey and basketball, after we focused on football last year. 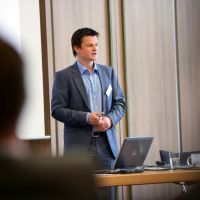 For brandbuilding and brand management we have a central key note from the German University of Sport in Cologne, Institute for Sport Economy and Sport Management what provides good theoretical basis for best practice examples. The new social media strategies are outlined by people from the German ice hockey club Kölner Haie,“ EHF Coordinator explained. Up to thirty managers not only from clubs, but also from leagues or national federations took part, including Christoph Wendt, the manager of the VELUX EHF FINAL4 participant HSV Hamburg, Bojana Popović, three-time winner of the EHF Champions League who switched to a new role as a sport director of Budućnost Podgorica last summer or Jacob Jørgensen, the manager of Team Tvis Holstebro, who won the Women's EHF Cup and finished third in the Men's EHF Cup Finals recently. “For me it is something completely new as I joined the club's management only after the last Olympics in London. I am glad a got this chance to come and listen and I hope we can use some of these ideas in our club too,“ Popović said. “When I saw the programme of this seminar I wanted to show up and listen to many interesting lecturers. I think it is a very valuable activity, because we have to keep going on and speak with each other about the development of handball,“ Wendt underlined.